Ungolim the Listener is a unique legendary Agility creature card. It is part of the Core Set. "Feel the Night Mother's love!" Ungolim first appeared in Oblivion. 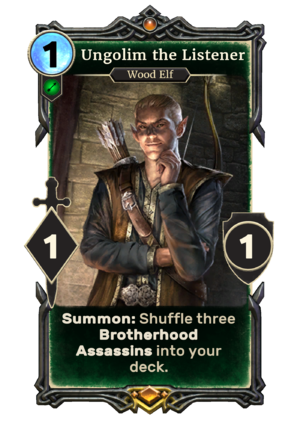 The Brotherhood Assassins created by this card contribute towards The Master of Assassins title. For more information on Ungolim, see the lore article. This page was last modified on 14 February 2019, at 00:01.